Original post Feb. 4, 2009. Enjoy Google Latitude on your phone, PC, or both. 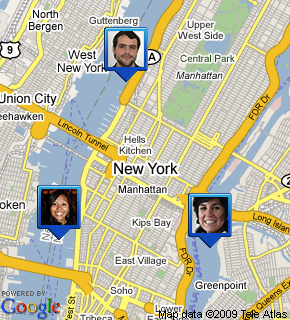 From your mobile phone – View your friends’ locations and status messages and share yours with them. From your computer – View your friends’ locations and status messages on a full screen even without a compatible phone or data plan. Click here to see your friends from your PC. See demonstration videos and more at Google . . . This entry was posted on Wednesday, February 11th, 2009 at 4:00 am	and is filed under Geography, Google Map Mashup, iphone, Mapping, Promote, Software. You can follow any responses to this entry through the RSS 2.0 feed. Both comments and pings are currently closed.